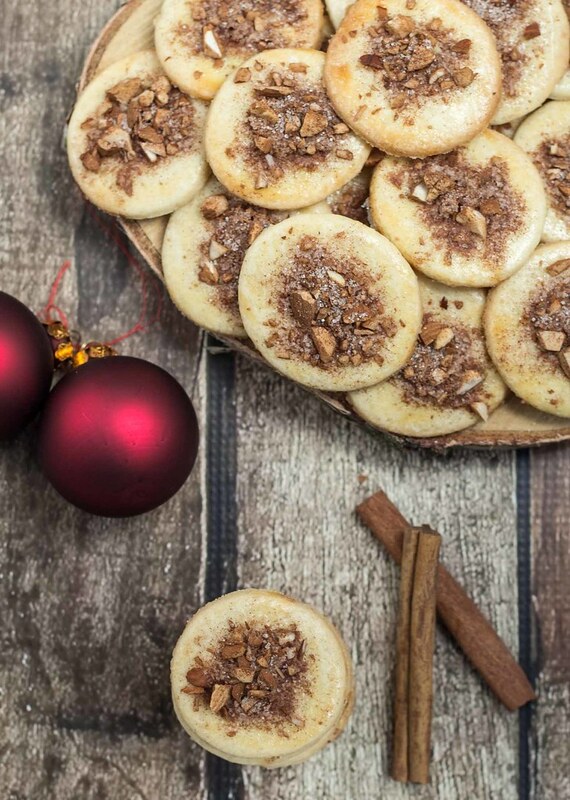 Jewish cookies is a very popular and delicious small Christmas cookies. 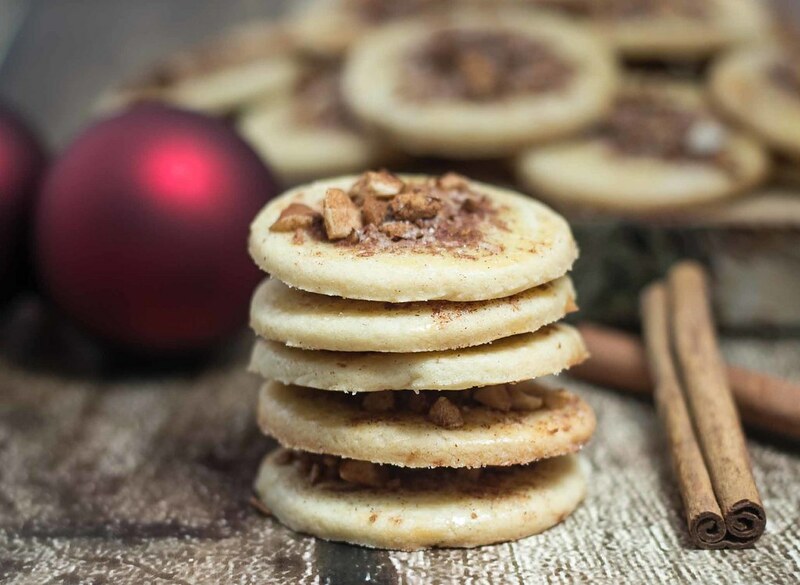 We both remember having had these cookies when we were kids and today it’s one of our great Christmas traditions to make these cookies. When they are in the oven they spread out the most wonderful spell of Christmas – which is one of the reasons we love to make them. We have read that this cookie got the name, Jewish cookie, because it was made and sold by Jews bakeries back in the 1700 century. 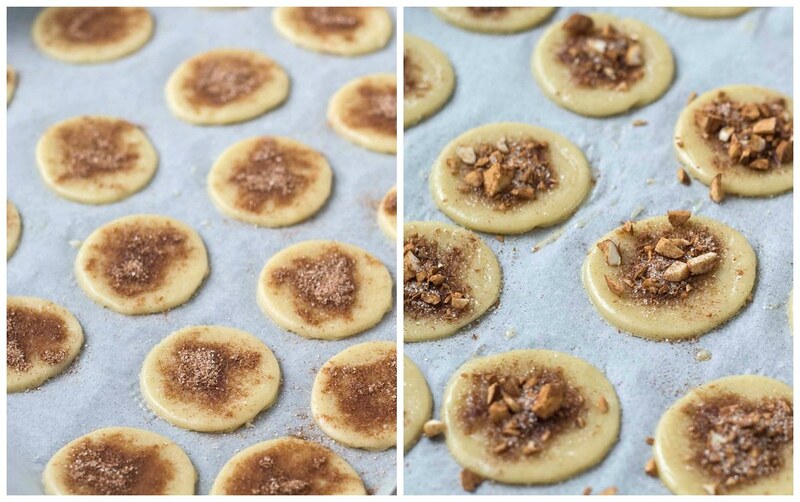 A Jewish cookie, or Jødekager as it’s called in Danish, is a small and simple cookie sprinkled with a mixture of sugar, cinnamon and chopped almonds. 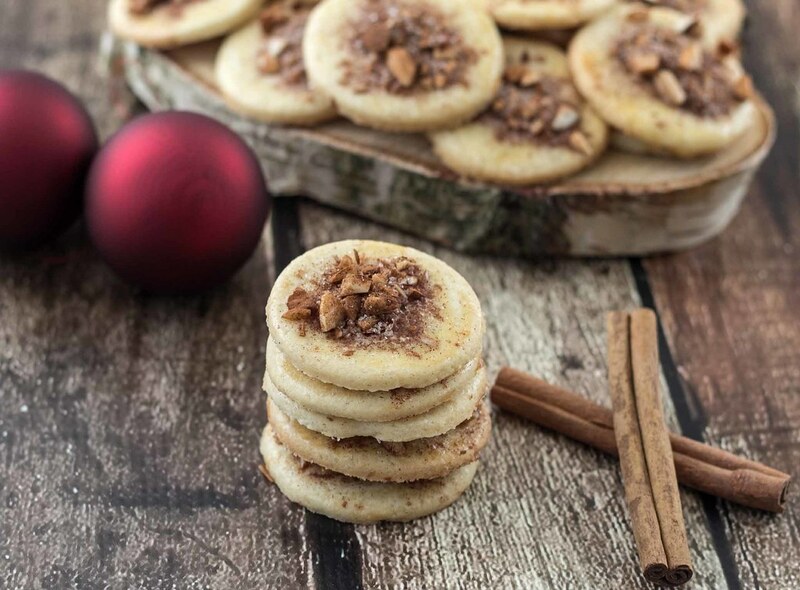 The recipe for these cookies are very easy to make and the step where the cookies are shaped using a glass cup or jar is especially a lot of fun for the kids – we both remember that we loved to make these cookies when we were kids. You can easily make the dough for these cookies a day in advance if you just keep it refrigerated. 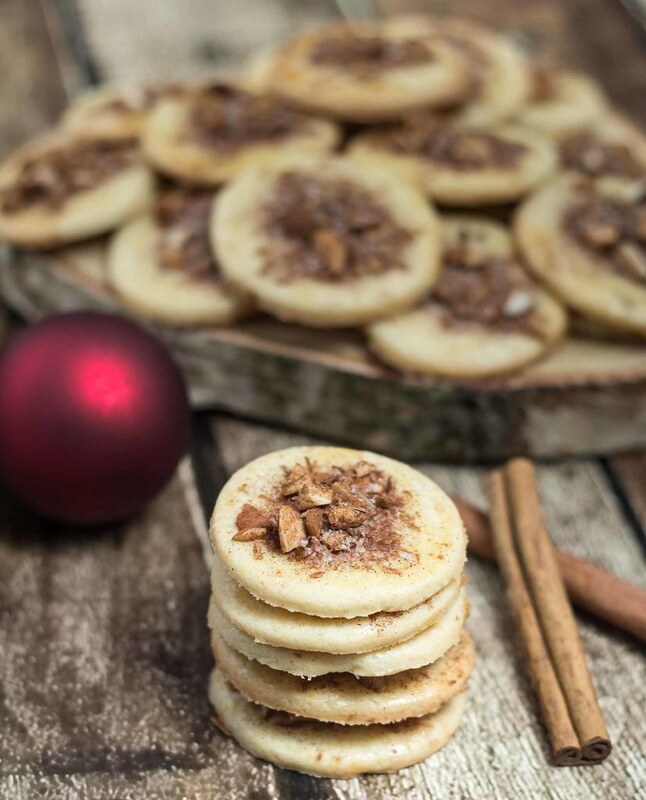 We have a category with traditional Danish Christmas recipes – please take a look if you are interested in getting inspired. Step 1: Pour the flour and the butter into a large bowl. 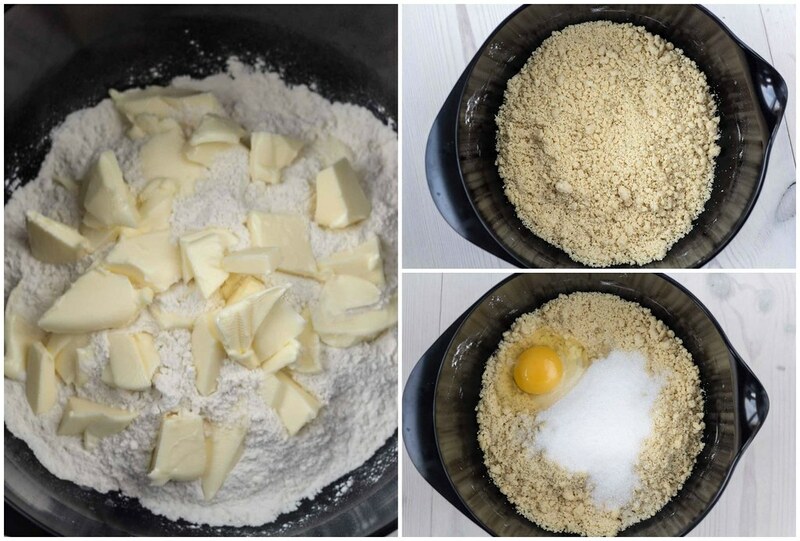 Use your hands to crumble/mix the butter with the flour. Add the sugar and mix. Step 2: Add one egg and knead the dough. Step 3: Cover the bowl with some plastic foil and place it in the fridge for about 30 minutes. Step 4: Roll out the dough into a sheet with a thickness of about 2-3 mm (~1/10 inch). 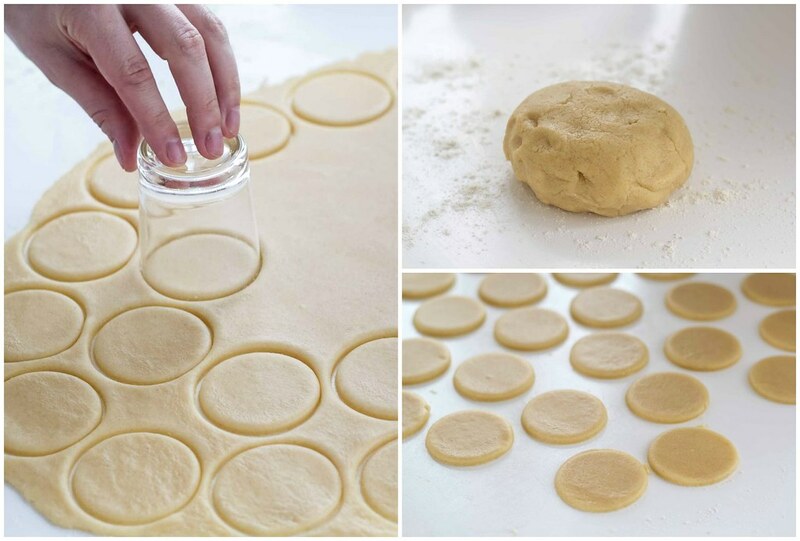 Step 5: Use a small glass with a diameter of about 5-6 cm (~2 inch) to cutout the cookies. Step 6: Place the cookies on an oven tray lined with parchment/baking paper. Step 7: Brush the cookies with a beaten egg. Step 8: For the garnish. Chop the almonds and mix them with sugar and cinnamon. Sprinkle the mixture over the cookies. Step 9: Bake the cookies at 200 C (400 F) for about 6-8 minutes. Step 10: Keep the cookies in a glass or cookie jar with some baking paper at the bottom so that they stay crisp. Grew up watching and eating Jodekager and Brunkager being made. Will now make some for Christmas 2015 and surprise the family with this wonderful find. I’m tempted to make some soon. I am going to try your recipe for Jødekage. I hope I have better success. My favorite cookie for Christmas. My Grandmother’s recipe called for Baker’s ammonium (ammonium carbonate) for extra crispness. Are there any specific recipes your are looking for? Can I freeze them , so many cookies to make this year and would like to get started? Actually, I have never tried to freeze them. However, it think that it is possible. I would do it before they are baked. Then you can bake a fresh batch whenever you feel for it. I baked Jødekager from a different recipe. I measured meticulously. So I did rum essence as well as the cinnamon and sugar etc. The dough tasted amazing but the baked cookies not so much. They taste sort of floury. They are not crisp. I had no salts of hartshorn so I saw that I can use baking powder. Should I reduce the oven heat slightly for a fan oven? Yes that would be a good idea. maybe just 15-20 degrees.